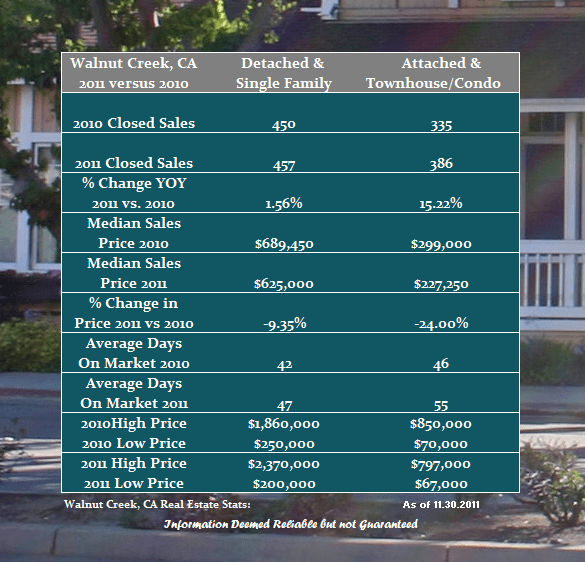 Walnut Creek real estate has been steadily moving forward compared to last year. A rise in the number of home sales has been good news. Median home prices have been under pressure but the marketing time to get a home sold has been less than a month and a half on average. Condos and townhouses have seen a dramatic increase in sales which have risen over fifteen percent. As with many of the surrounding communities median pricing has taken a hit but marketing times are still good. Remember all real estate is local so each neighborhood can and will perform differently. Now is the time to take a breath and enjoy the Holidays but if you are looking to buy a new home or considering selling I am always here to help. Share the post "Walnut Creek 2011 Real Estate Review thru November"